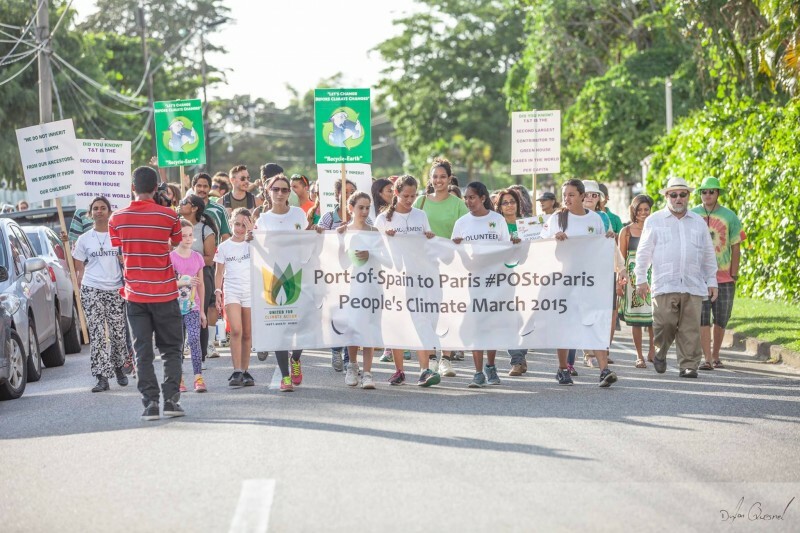 Climate change awareness is sweeping from Port of Spain to Paris. Photo by author. This past Sunday, November 29, concerned citizens of Trinidad and Tobago gathered , for the second time , under the banner of the non-profit organisation IAMovement  to lobby and march for climate-change awareness . The theme of this year's event was “Port of Spain to Paris”—an acknowledgement of the fact that the French capital is the location of the 2015 United Nations Climate Change Conference , but also a gesture of solidarity in the aftermath of the Paris attacks  of November 13. 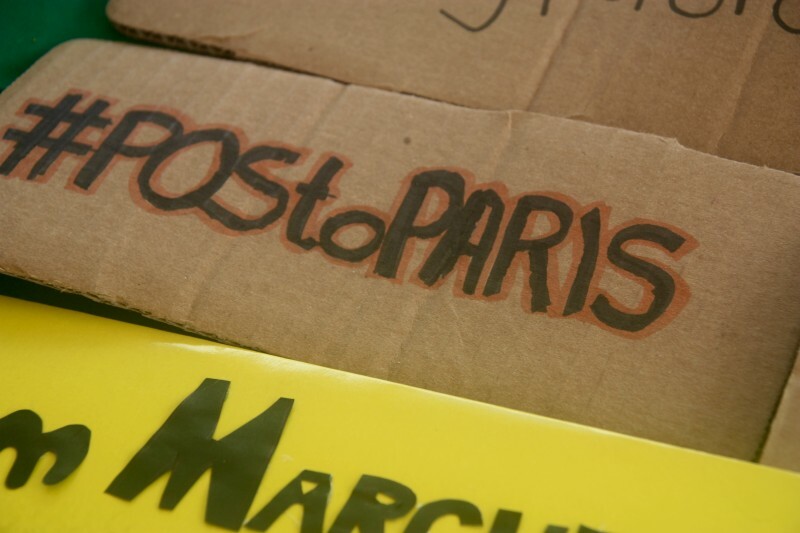 During the opening ceremony of the event, there was one minute of silence for the victims of the Paris attacks, and for the audience “to think about the world and how we are all connected.” The hashtag #POStoParis  gained significant popularity on Twitter. These climate change negotiations in Paris are perhaps the most critical since the Copenhagen Climate Change Conference  in 2009, but a lot has changed  since then—both the United States and China, two of the world's largest emitters of greenhouse gases, appear willing to do what is necessary to reach a deal, although US President Barack Obama says that any agreements reached in Paris should not be legally binding— a position contrary to the intent of the conference. Climate finance , whereby richer countries help poorer ones cut emissions and deal with the effects of climate change, is becoming more commonplace, as are rallies—just like the one in Trinidad—supporting the movement away from fossil fuels. 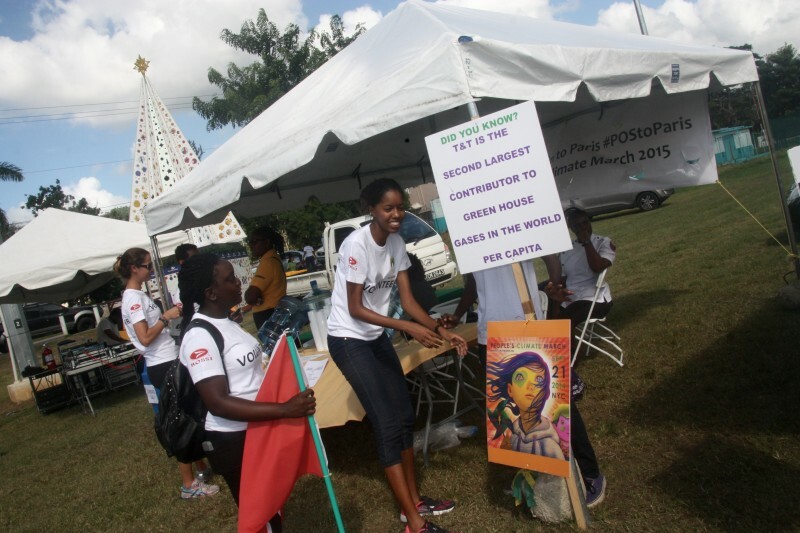 Participants at the Climate Change March in Trinidad, November 29, 2015. Photo by Dylan Quesnel, courtesy IAMovement, used with permission. Still, there are stumbling blocks. Waiting ten years, by which time the US says it will have reduced its emissions by 26-28 percent, or even 15 years, when China expects its emission levels to peak, seems like a long time, given scientific findings  about the rate of climate change. 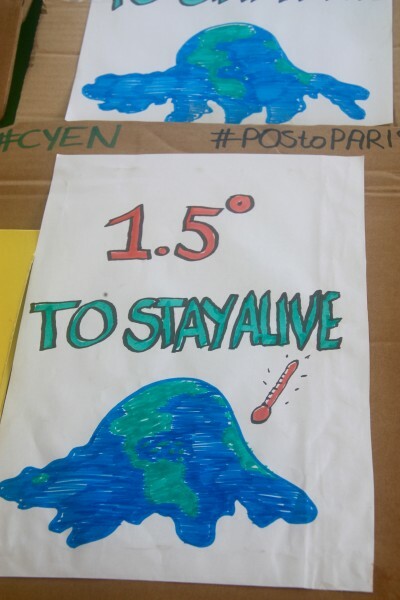 1.5° to stay alive — the message from the Caribbean Youth Environment Network. Photo used with permission. Despite such intransigence, the IAMovement rally managed to attract participation from many government organisations that are taking innovative steps to reduce the effects of climate change in Trinidad and Tobago. There was also a strong youth presence via the Caribbean Youth Environment Network (CYEN); the organisation's interim Chairperson, Rianna Gonsalves , was proud of the fact that CYEN sent several representatives to the Paris talks, where their goal is to agitate for “1.5° to stay alive”—meaning that human survival in the face of climate change will require a drop in temperature of at least one and a half degrees Celsius. The Paris talks have set a goal  of reducing greenhouse gas emissions to limit the global temperature increase to 2°C above pre-industrial levels. At the event, there were booths from Solid Waste Management Company Limited  (SWMCOL), a state company mandated to provide both the government and the private sector with consultancy services in proper waste management; the Ministry of Planning and Development ‘s Green Fund  Executing Unit, as well as private eco-minded companies like Green Warriors , which offers services like battery recycling  free to the public. 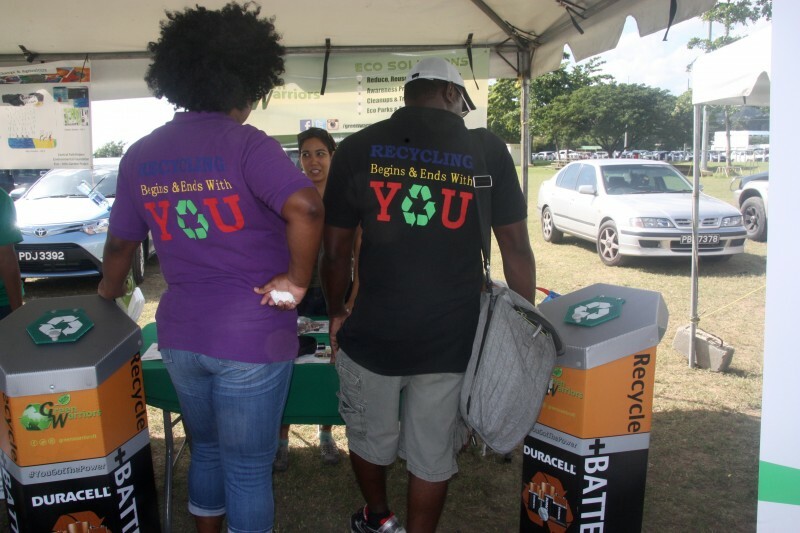 Educating attendees about the importance of waste management in Trinidad and Tobago. Photo used with permission. SWMCOL's Public Education Administrator, Gisele Telfer, noted that the company was very active in environmental education and raising awareness about climate change via its Community and Youth Outreach Programme . Through a series of animated videos, the company goes to schools throughout the country to teach kids about the environmental effects of littering and ways in which to keep recyclables out of the waste stream. SWMCOL also offers a heavy-duty shredding service  and a mobile tire shredder, as used and scrap tires contribute significantly to poor environmental care in Trinidad and Tobago. The country's primary mode of transportation is vehicular, with public transportation options (at least on land) being limited to buses and taxis. Additionally, it would improve overall cleanliness in our land, rivers and oceans, and would help to raise the dignity and sense of care and appreciation for residents of heavily polluted areas such as the Beetham , creating incalculable social and health benefits. Trinidad and Tobago is the second highest carbon emitter per capita in the world. Photo used with permission. 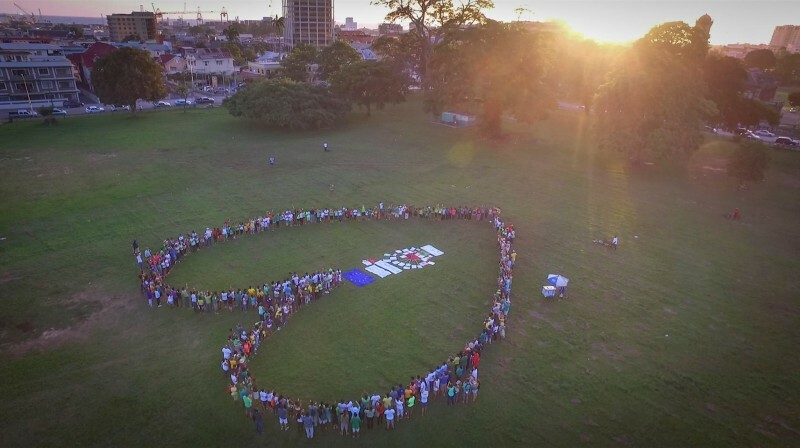 Drone image of some of the participants in the Climate Change March in Trinidad and Tobago. Photo courtesy IAMovement, used with permission.